Along with yesterday’s release of the new video Walkman’s from Sony, they also released a smaller, non-video line of Walkmans which were somewhat overshadowed in the announcement. Although the new NWZ-B100 series do not have video, they do have a 3-line color LCD display to show functions and tracks playing. 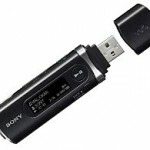 The small Walkman supports playing MP3 and WMA audio files and is compatible with Microsoft’s PlayForSure music service. It also has a FM tuner with the ability to set as many as 30 preset stations, and it can record the radio broadcast directly to the player as MP3′s. It also has a microphone built-in should you want to record your own, personally sung songs to the player for future easy-listening. Sony says the battery on the B100 series players will give up to 12 hours of continuous playback and is charged through a direct USB connection, which is the same way files can be transferred to and from the player. This Walkman in a couple models differing only by capacity. The NWZ-B103F holds 1GB, comes in only black and will retail for about $60. 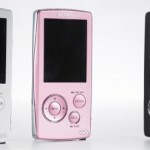 The NWZ-B105F has double the capacity at 2GB, double the colors (black or white) and will go for around $80. Both are available for pre-order now from SonyStyle and are expected to ship on September 2.